All developed countries dedicate large sums of taxpayer money to assist the poor overseas. That assistance struggles to transparently reach the poor, to achieve transformative impact, and to contain costs. A new CGD study shows the promise of an entirely different way to assist some of the same people: short-term overseas work. We use rigorous impact evaluation methods to estimate the economic effects of short-term work by a small sample of farmers from Haiti in the United States, where no US workers are available. We then compare these to the effects of more traditional assistance. We find that this work benefits Haitian families much more directly, and to a dramatically greater extent, than more traditional forms of assistance—raising workers’ current earnings on average by multiple of 15. Overseas work by these Haitian farmers also differs fundamentally from traditional assistance by benefiting both the US and Haitian economies, in similar measure. There is enormous room for donors to explore expanded policies to foster mutually beneficial international labor mobility alongside traditional assistance. In 2010, a catastrophic earthquake in Haiti left more than 200,000 people dead and over US$8 billion in damage. Traditional post-disaster assistance projects surged in Haiti, varying greatly in their ability to transparently reach and transform the lives of the poor. A study by the Center for Global Development proposed, as a complement to those important efforts, that the US Secretary of Homeland Security make Haitians eligible for temporary seasonal work visas to the US. At the request of leading members of the Florida Congressional delegation and others, she granted Haiti eligibility for the visa in 2012. In 2014, a program was created using that visa to match Haitian farmworkers with US farms where US workers were unavailable. It was set up by the International Organization for Migration and the humanitarian organization Protect the People—which now runs the program together with two agricultural cooperative associations in Haiti. The program’s goals are to contribute to the post-earthquake recovery while deterring illegal migration and benefiting the US farm economy. The scale of overseas work to date has been small, constrained primarily by US policy barriers. In 2015, US employers sought to hire 62 workers through the program; due to US Department of Labor and Department of State restrictions, in the end 14 workers were able to conduct agricultural work in the United States in 2015. Seven worked in a plant nursery in Alabama for 13 weeks and seven others harvested apples in Oregon for four weeks. All demonstrated full compliance with the terms of their visas. We measure the effects of short-term overseas work on these Haitian households by comparing them to otherwise identical households with a member prevented from traveling by regulatory obstacles—obstacles that were unrelated to their individual characteristics. We find three major ways that this program differs from more traditional development assistance: the size of the income gains, the direct benefit to poor families, and the mutual economic benefit to both countries. Working temporarily in the United States raised the daily value of Haitian workers’ labor by a factor of fifteen. For families whose worker could not travel to the US, total income averages US$147 per month. For families whose worker was able to travel, while he was in the US the family earned US$2,278 per month. What each worker normally earned in Haiti in a week, he was able to earn in the US in two hours. A black dot represents a single household. The blue diamond shows the average for each group, surrounded by a statistical margin of error that accounts for the small sample size. Due to this dramatic increase in the return on their labor, the workers were able to roughly double their families’ annual average income with only a month or two of work. Figure 2 shows monthly—averaged over the course of a full year—received by members of the household who remained in Haiti. This average includes remittances and repatriated savings from the time that workers who traveled were abroad, but may not include savings personally retained by the worker after return. For those in Haiti who had a household member travel to the US, average monthly income over the preceding year was US$364, compared to $US147 for households whose worker was not allowed to travel. These effects are so large that they are statistically significant even in this small sample. 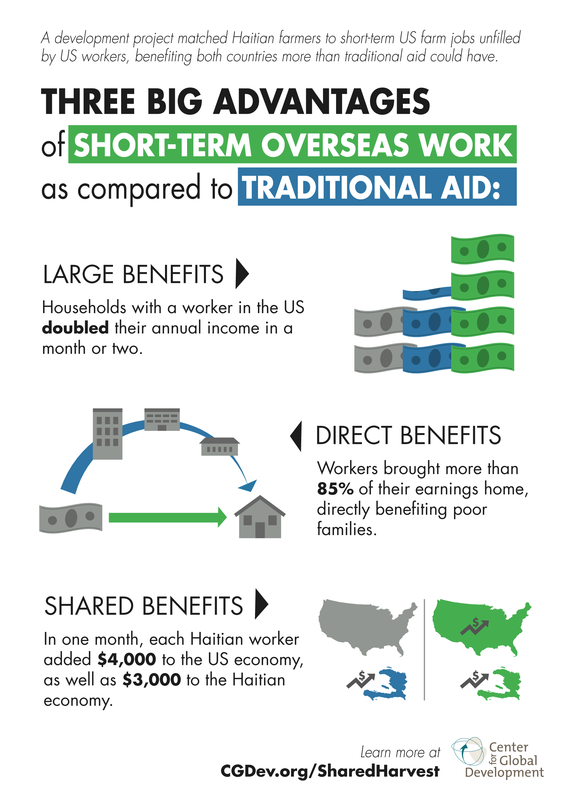 Unlike traditional aid, income earned by Haitian seasonal workers in the US goes directly to Haitians and their families. More than 85 percent of money earned in the US is brought or transferred to Haiti, and spent in Haiti by a poor family. It is difficult to identify a program of traditional antipoverty assistance or international charity that targets poor families with similar directness. For example, ActionAid estimates that roughly half of all official development assistance does not reach the poor in any form. Households benefiting from US work expressed plans to invest the earnings from abroad in durable goods and productive capital. At the time we surveyed them, seven households with a member who traveled had already made major expenditures: two began home construction work (Figure 3), three bought durable goods, and four paid down outstanding debt for agricultural investments. Expenditures from US earnings ripple through the local and national economy, raising GDP by roughly two dollars for each dollar spent. We therefore estimate that each worker-month of Haitian seasonal agricultural work in the US contributes at least US$3,000 to Haiti’s current GDP. This is such a large impact that even moderate numbers of workers could have macroeconomic effects. If 4,000 Haitian workers per year were to perform five months of similar work in the United States—fewer than the number of workers on the same visa who come annually from the smaller country of Jamaica—this would generate a financial flow of over $30 million per year. Unlike a numerically-equivalent flow of traditional aid, essentially this entire amount would be spent by poor Haitian families, within Haiti, on locally-produced goods and services. The aforementioned evidence on local multipliers implies that this would increase Haiti’s GDP by an annual amount on the order of US$60 million. Perhaps the most fundamental difference from traditional development assistance is that these Haitians’ work expands the US economy, particularly its rural farm economy. US farmers are able to expand production and make investments requiring manual labor that the US Department of Labor certifies them as unable to find. Rather than costing taxpayers, the US seasonal work visa generates positive net tax revenue. The farmers in the program spend most of their income from increased production in their own states. These expenditures too have local multiplier effects. US Bureau of Economic Analysis regional models conservatively imply that one worker-month of Haitian labor expands the US economy by more than $3,720 (Oregon) to $4,140 (Alabama). These multiplier effects also imply that the added farm productivity from an additional Haitian seasonal worker creates roughly two jobs for local US workers. These results suggest large unexplored potential in fostering temporary labor mobility as a policy to assist the poor overseas. It is a policy alternative with much larger and more direct benefits for any given family than traditional aid, with direct economic benefits to both the rich and poor country involved. New Zealand is currently the only country that has made temporary work arrangements of this kind a centerpiece of its development assistance to poor countries in its region—through its well-regarded Recognized Seasonal Employer program. Donors of development assistance should study these experiences to design, test, and scale up programs to foster temporary overseas work alongside more traditional aid efforts. Many development cooperation agencies lack even a single staffer to explore high-value options for assistance through international labor mobility. Seizing opportunities of this kind will require some donors to broaden their field of action beyond 20th-century mandates to send traditional aid. This means devoting new administrative sections and modest human resources to exploring the more effective and more efficient assistance offered by labor mobility in appropriate settings. In this 21st-century world, migrants’ remittances to poor countries are several times larger than all foreign aid on earth put together. It is past time for donors to adapt their mandates and structures accordingly. The full details of this research, including statistical analysis and references, are presented in Michael A. Clemens and Hannah Postel (2016), Temporary Work Visas as US-Haiti Development Cooperation: A Preliminary Impact Evaluation, CGD Policy Paper 101, Washington, DC: Center for Global Development. We thank Protect the People, the Sohaderk Cooperative, and the Feccano Cooperative for their assistance with the evaluation.